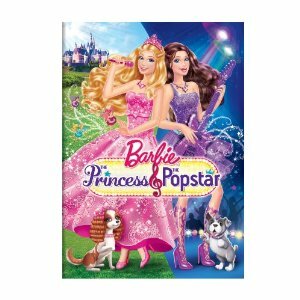 Mark Twain’s classic The Prince and the Pauper gets a glamorous modern makeover in the new DVD release from Universal Studios, Barbie: The Princess & the Popstar. While Twain contrasted two opposites – a prince, which everyone would want to be, and a pauper, which was not so attractive – Universal’s two heroines both live a life that every young girl thinks she wants. But glamour isn’t necessarily all it seems to be. As KIDS FIRST! youth film critic Cheyenne Nguyen, age 8, observes in her review, below, “There are always things that you would like to change, but accepting who you are will make you a happy person.” Viewing the film also may make you a happy person. “The dance moves are amazing and make me want to stand up and dance along with the movie,” says 7-year-old KIDS FIRST! youth film critic Morgan Bertsch, describing the music and singing as “fun and upbeat.” See the video review with both girls here.